A brief report from Lydia Cole on the recent C-PEAT meeting convened at Columbia University in New York. We spent one break-out session seeing if we could provide new insights into what the critical controls on peat formation might be. After learning from the talks about the huge range of peatlands present today and during the past, from the diverse forested swamps of Papua New Guinea, to the high-altitude Andean ‘cushion’ peats, to the organic-rich sediments buried under glacial tills in Canada, all with their differing physical parameters, this proved challenging. As did attempts at making generalisations about peat formation through time; time being hundreds of millions of years. One scientist aptly commented that “coal is carbon; peat is water”, which helps to explain part of the picture! There were a number of discussions about deep-time peats and coal, and whether we could make inferences on their development dynamics based on more recent peat formations. A work in progress (by the Deep-time and Buried Peats Thematic Groups). Rain quenches the flames: but what of the future? The rain has arrived, and as the map above shows, the smoke and haze from this year’s fires is beginning to clear. Although particulate levels remain dangerously high in some areas, it is hoped that these will return to normal in the next few weeks. But what now? Although 2015 has seen record-breaking carbon emissions and dangerous pollution levels that some have described as the worst environmental disaster of the 21st century, if the draining of peatlands and the careless application of fire to clear land continues a similar disaster could happen in just a few years if not sooner. 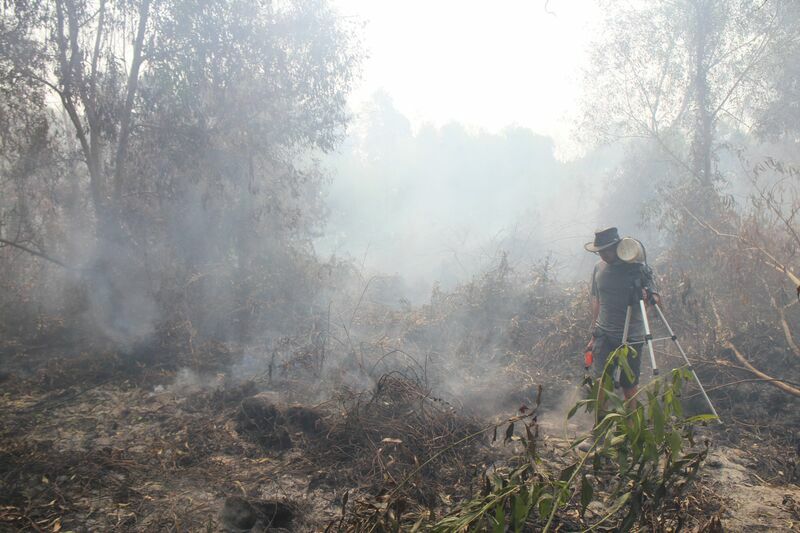 As many have pointed out, the thick haze caused by burning peat and forests is not a new phenomenon in Indonesia, yet previous fires have not led to the determined action required to prevent them from being an annual occurrence. This year’s fires have been exacerbated by El Niño conditions, but bad fires also caused record-breaking pollution levels in 2013 when there was no El Niño. There is increasing pressure from the international community, including from the Obama administration, to prevent a re-occurrence of the terrible fires which happened this year. There are now promises from the Indonesian government that action will be taken, particularly with regard to peatland restoration, but the international community must hold them to this action. If the right measures are put into place, not only would there be massive health benefits, but it may be one of the easiest ways for Indonesia to achieve its commitment to reducing carbon emissions by the promised 26% by 2020.